SEATTLE--(BUSINESS WIRE)--The Goodship, Washington state’s popular and beloved cannabis edibles brand, announced today that it has joined the Privateer Holdings family of brands. Together, The Goodship and Privateer Holdings will develop new products and expand the brand’s availability to consumers in new markets across North America. Stellar baking and confection-making are at the heart of The Goodship. With a classically trained baker at the helm of all recipes, each product is lovingly developed with precise cannabis dosing to ensure a great flavor and balanced high. Signature products include multiple flavors of mouthwatering chocolate bars, cookies, brownies, and other delicious confections like fruit jellies, peppermint patties, and micro-dosed pastilles. 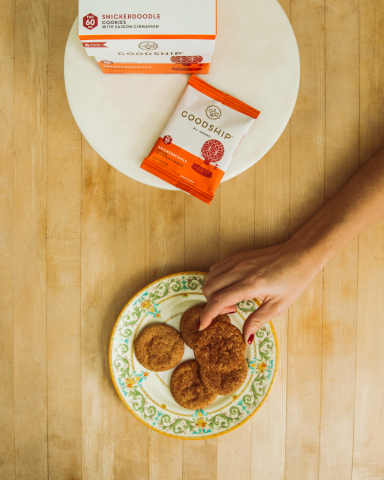 From Saigon Cinnamon Snickerdoodle Cookies and Double Fudge Brownies to Ra-Ra Raspberry Fruit Jellies and Peppermint Pastilles, Goodship products are made from all-natural, sustainable, and locally sourced ingredients with organic and fair-trade chocolate. Vegan and gluten-free options are also available. View the full line of Goodship products here. Privateer Holdings is the world’s first and leading private equity firm to invest exclusively in legal cannabis. The firm has raised more than $150 million to invest in a portfolio of cannabis brands that currently employ more than 500 professionals working on the ground in 7 U.S. states and 7 countries. Leafly® – The world’s leading cannabis website and mobile application, with more than 13 million monthly visitors and the world’s largest database of user-generated reviews of cannabis strains, products and dispensaries. Tilray® – A global pioneer in medical cannabis research, production, and distribution, currently serving tens of thousands of patients, physicians, pharmacies, governments, hospitals, and researchers in eight countries spanning four continents. Marley Natural™ – A premium cannabis lifestyle brand rooted in the life and legacy of Bob Marley. Marley Natural cannabis products are currently available in California, Washington, and Oregon, with body care and smoking accessories available nationally and internationally via www.MarleyNaturalShop.com. Privateer Holdings is the world’s first private equity firm to invest exclusively in legal cannabis. The Privateer Holdings team has raised more than $150 million to invest in cannabis brands, including portfolio companies Leafly, Tilray, Marley Natural and The Goodship. Learn more at www.privateerholdings.com. Founded in 2014 by Jody Hall, The Goodship creates the most delectable cannabis-infused baked goods, chocolates, and confections on the market. Board The Goodship at www.thegoodship.com. The Goodship, Washington state’s popular and beloved cannabis edibles brand, is joining the Privateer Holdings family of brands.